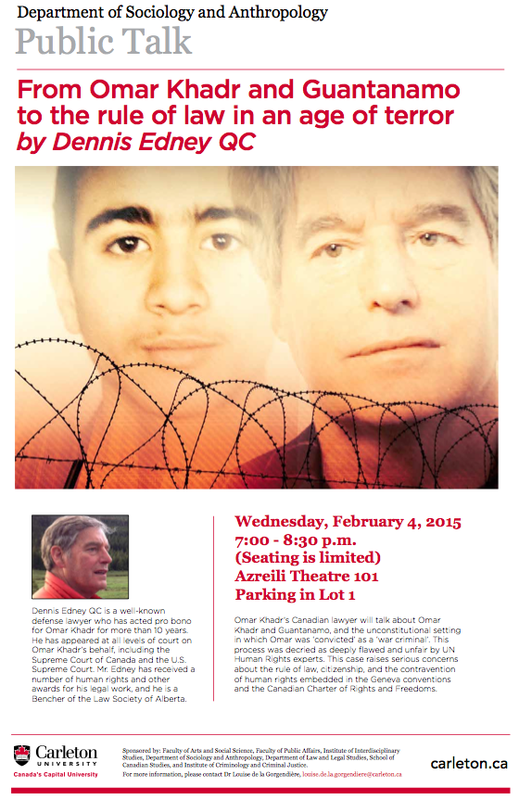 Dennis Edney, lawyer for Omar Khadr for more than 10 years, will give a lecture at Carleton University on Feb. 4, 2015 called From Omar Khadr and Guantanamo to the Rule of Law in an Age of Terror. Edney will discuss Omar Khadr, Guantanamo and the unconstitutional setting in which Omar was ‘convicted’ as a ‘war criminal’. Human rights experts decried the process as deeply flawed. According to Edney, the case raises serious concerns about the rule of law, citizenship and human rights embedded in the Geneva conventions and the Canadian Charter of Rights and Freedoms. When: Wednesday, Feb. 4, 2015 from 7 p.m. to 8:30 p.m.
Edney is a well-known defense lawyer who has acted pro bono for Omar Khadr for more than 10 years. He has appeared at all levels of court on Khadr’s behalf, including the Supreme Court of Canada and the United States Supreme Court. He has received a number of human rights and other awards for his legal work, and he is a bencher of the Law Society of Alberta.